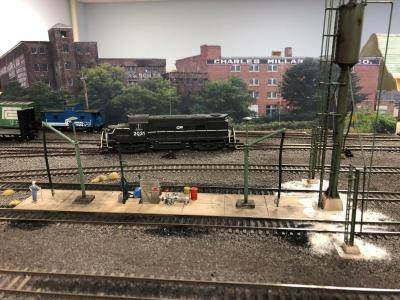 Finished up the locomotive servicing pad. The Woodland Scenics kit was a real pain in the neck, the casting was really very poor and took a lot of work to clean up, also the fuel cranes were so very poorly cast that I couldn't get them straightened out enough to look acceptable let alone to clean the flash off of them as they are very delicate. Replacement fuel cranes from Alexander Models were substituted and are much nicer in my opinion. The pictures captured this okay but in person the effect is even more dramatic. Note: The sanded grout has a real good resemblance to "industrial dirt" and I'm going to give it a try in a couple places and post the results in the future.